‘Oomamaboomba’ is a suitably unpronounceable title for an enigmatic work, displayed amongst other reliefs made by Eva Hesse on a 1965 German residency. Sung aloud, it might sound like a musical riff. These works at Hauser and Wirth on Savile Row anticipate her mature and final sculptural pieces, famously described in a 1966 exhibition as a manifestation of a particular feminine ‘eccentric abstraction’ by contrast with the muscular materiality of sculptors like Judd and Andre. But this particular title has a suitably musical quality for a work that employs hot pink and lime shapes arranging themselves into snug fitting forms within the rectangular frame. 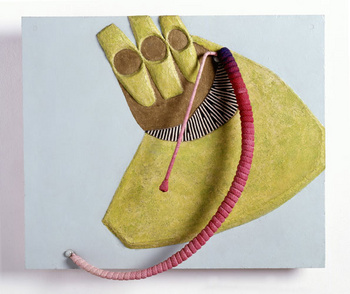 ‘Oomamaboomba’ has a jazzy quality made from textured papier mache from which a curving handle of twisting twine rises into real space, from rose-pink at the foot to a wider indigo at the top edge of the picture. Another relief, ‘H + H’ juxtaposes acidic-lemon against fleshy-pink thereby evoking a sixties’ trippy, hedonism. Across it flows a meandering wire, establishing tensions between shape, texture and colour. Lent a room within a texile factory for her residency, Hesse plunders the found scraps of metal and cord to create fantastical reveries that possess a satisfying self-sufficiency. Alongside the reliefs are a series of drawings that combine the organic and artificial. Random parts seem to cohere into logical and complex interdependence. These line drawings of ink on paper then evolve into more elaborate coloured paintings that resemble nesting boxes or compartments of imaginary objects which settle into co-existence. Description verges on the edge of elusive abstraction. All we see with certainty are linear forms of unidentifiable objects that appear to serve some functional purpose akin to the guts of a machine. But it’s the reliefs that seduce the visitor with their dichotomies of sharp and soft, line and form, flat colour and stripe, surface and relief. While demonstrating a self-possession that is difficult to penetrate, these hybrid painting/ sculptures suggest a pleasing reverie in which Hesse takes these materials on an adventure away from specific narrative, time or place. 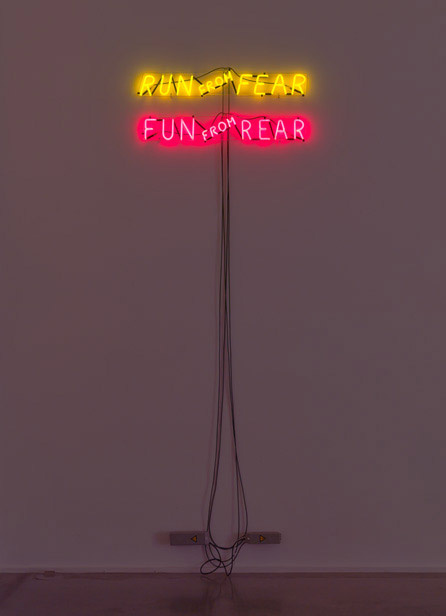 Bruce Nauman exhibits his restless teasing in a companion show called ‘Mindfuck’ using neon, architectural installation, and a revolving carousel all dating back to the seventies and eighties. There are distinctive contrasts of subject and style with Hesse’s practice and it is inspired programming to place their two shows side by side. Nauman’s provocations test one’s mental boundaries. Apparent certainties of physical space and language are cunningly subverted. A giant box within the gallery operates as the facsimile of a room but in order to enter the visitor must walk down a tapering corridor until the body touches the walls and then is forced to twist ninety degrees to squeeze into a large space. Here you are steeped in green light resembling vomited bile or pickling acid. Skin becomes the colour of morbid ill health and hints at gangrenous decay. And so Nauman introduces a phenomenological encounter of the body with extremity. Instead of detached contemplation, you are immersed in an oppressive environment. But there is little relief outside. A giant illuminated board neurotically states over fifty simple phrases that resemble ‘affirmations’: ‘I was a good boy, you were a good boy, we were good boys’. These statements momentarily light up and then disappear. On this giant neon, circuit board, we chart the randomness of life accompanied by an search for structure. The result is to feel anxiously out of step, persistently behind the flow of lit words that jump around. Cast as passive readers, we are trying to keep up with a language that begins to collapse under the weight of repetition. To watch this fluorescent messaging is to experience a symbolic nervous breakdown. Our grip on language as a thread of civilized communication is broken. Finally, as if our bearings haven’t been disrupted enough, Nauman presents the visitor with a carnival of cruelty. A carousel of animal bodies and severed heads is held up by wire in a never-ending circular procession. It is almost unbearable to watch as their feet drag on the floor to make deep, scratched incisions, evoking hellish torture. With relief we read a darkly comic word piece above, ‘run from fear, fun from rear’, alluding to instincts of escape and sexuality. In Nauman’s world, letters merely need to slip out of place and we tumble into rhyming incoherence.